Abandon Ship is a roguelike strategy-RPG in which you command a ship in a fantastical version of the Age of Sail. You will explore a procedurally generated world, taking on quests, dealing with random events, and engaging other ships in combat. For more imaginative, quirky passion projects, check out the best indie games on PC. 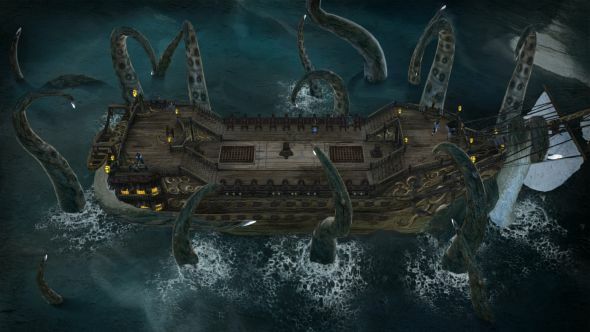 Abandon Ship is the debut game from Fireblade Software. A new but experienced team, they claim inspiration from “the exceptional” FTL, Sunless Sea and Assassin’s Creed Black Flag. In combat, you’ll order your crew around the ship to perform such actions as firing and reloading cannons, steering, and performing repairs. You can change the distance between your ship and your enemy, and even board them if you wish. As you explore the procedural world, uncovering and pursuing quests, you’ll also have to deal with random events such as sea monster attacks and storms. Lightning strikes can ignite fires, tidal waves can wash crew overboard if they’re unprepared, and so on. You can customise and upgrade your captain, ship and crew to face any foe, whether human or otherwise. Death can be permanent, but this doesn’t necessarily happen if your ship is destroyed. You can try to make it back to a port, where you can find a new ship and continue your quest (this is much easier if you’ve escaped in a lifeboat). Abandon Ship is expected to release some time in 2017. You can learn more on the game’s Steam page, or at its website. Sign up to Fireblade’s mailing list for a chance to get a crew member named after you in-game.